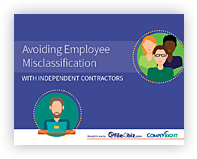 The most common 1099 form, the 1099-MISC, is used to report payments of $600 or more to service providers — typically work done by an independent contractor who is a sole proprietor or member of a partnership. Examples include graphic designers, Web developers, cleaning professionals, freelance writers, landscapers and other self-employed individuals. Basically, the 1099-MISC form is to independent contractors what the W-2 is to employees. Of the more than 15 types of 1099s, small businesses use the 1099-MISC most often. The 1099-MISC captures non-employee compensation, in addition to documenting that you didn’t deduct any federal, state or other taxes. Unlike employees with W-2s, independent contractors get their full pay without any automatic deductions. It’s up to them to keep track of their taxes and pay them directly to the government. 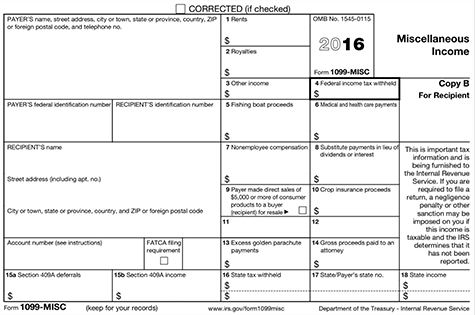 Get more tips on how to determine who gets a 1099-misc form here. Business information – Your Federal Employer ID Number (EIN), your business name and your business address. Recipient's ID Number – The recipient's Social Security number or Federal Employer ID Number (EIN). Section 409A Deferrals and Income - Boxes 15a and 15b require you to record Section 409A deferrals and income, which pertains to non-qualified deferral compensation plans. State and Local Information - Enter the amount of state tax withheld (Box 16), the state/payer's state number (Box 17) and state income (Box 18). If you need to enter information for more than two states, you should complete another 1099-MISC for the information. Copy A — File with IRS by the paper or electronic-filing deadline. Copy 1/State Copy — File with the appropriate state taxing authority, if applicable. Copy B — Distribute this copy to individuals, who then file it with their federal income tax return. Generally, it must be delivered by January 31. You will meet the IRS’ distribution requirement if the form is properly addressed and mailed on or before this due date. Copy 2 — Distribute this copy to individuals, if applicable. Individuals will then file this copy with their state taxing authority. Again, it generally must be delivered by January 31. Copy C — Retain this copy for your records. How do you file your information returns? If you’re using paper forms or software, you’re spending way more time and effort than needed. Whether you’re filing one form or a hundred, doing it online is a much more efficient, streamlined process. Say goodbye to the time-consuming task of filling out paper forms manually or downloading and navigating software. With cloud-based e-filing, you just enter or upload your data and the e-file provider processes, prints, mails and files for you. You’ll enjoy secure and accurate 1099 filings, as well as greater flexibility and convenience. Everything is at your fingertips and easily accessible — any time, anywhere.